We’ll come out and say it to begin with: Search for Azcanta is probably undercosted. There have been effects like this in the past, but they didn’t cost two mana. The front side of this card offers powerful library manipulation. Sure. It sets up the top of your deck. But that’s not all! Search for Azcanta not only pushes aside clunky or expensive spells, it sets up graveyard synergies! Subtly, the “flip” ability is a may, not a must. 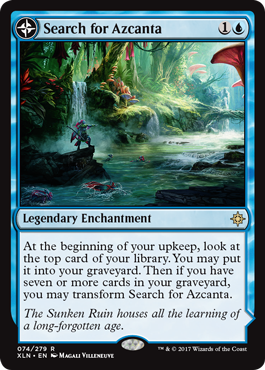 While you will usually want to be flipping it, there are times that Search for Azcanta will be better for you than Azcanta, the Sunken Ruin. Don’t worry: You get to pick. First of all, it’s a kind of weird Rampant Growth. 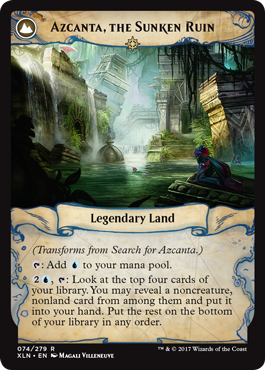 If you have Search for Azcanta on the battlefield and say four lands… When it flips, you will have five or six mana (depending on land drop). That, in and of itself, is a pretty big get for blue. Further, this card is just begging for you to cheat! No, not “cheat” in the sense of getting banned from DCI sanctioned tournaments… Cheating the flip condition. While the front-side enchantment will get you to the point where it will flip eventually, there is no reason to wait around. Cards like Strategic Planning are screaming to help you flip to the legendary land. While Search for Azcanta has our boys the most excited, there are tons of other flip cards worth talking about. We love Legions Landing, generally dislike Arguel’s Blood Fast. But where and when will even that be played?